Day 4: May 1, 2015. This morning we had a talk by Hugh Ellwood about Greek cities in Asia Minor. It was very good. Then we met the people arranging the excursions and heard what was arranged for today and tomorrow. Our ship docked in the port of Izmir at about 2 pm. 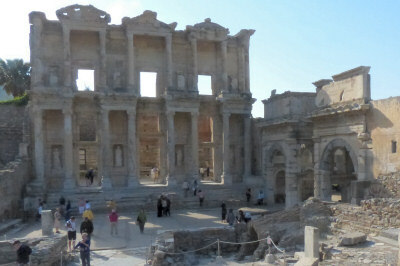 We boarded our Green Group bus and drove to Ephesus. Because local roads were closed for the Turkish national bike race (Tour de Turkey), we had to park at the bottom of the hill and walk up through the ruins - not as bad as we feared. We all have a receiver and earphone so we can hear our guide, even if we are several metres away or there are other groups in the vicinity. This is very handy so we can stop to take photos without losing our group - we just look for and follow the green lollipop sign. 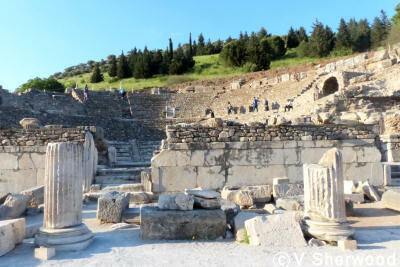 Ephesus is really fantastic. Our first view of it was the marble Harbour Street lined by columns leading to the magnificent theatre - much more impressive than the view at the upper gate - so maybe we were lucky there was a bike race and we did the tour backwards. 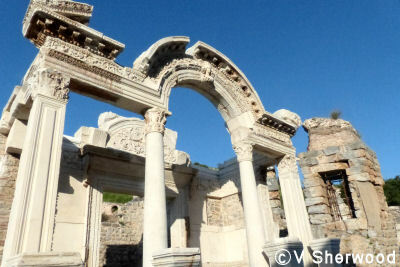 We will stay overnight in Izmir and take a bus tomorrow morning to Pergamon. . 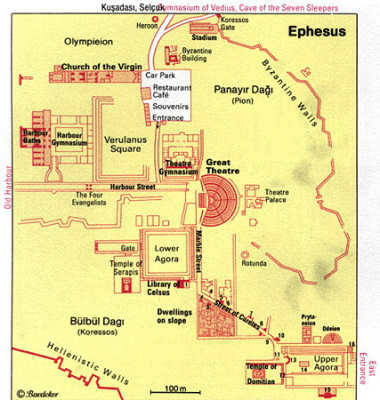 This is a map of Ephesus. Our tour started at the top centre and ended at the bottom right, uphill all the way. Normally we would have done it the other way around but there was a bicycle race in the region and many roads were closed. The trek uphill was not as bad as we feared as there were lots of stops along the way.. Entering at the lower gate had its advantages. 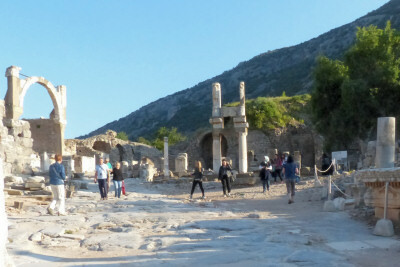 This is probably the way most people entered Ephesus in ancient times. They would follow this steet (Harbour Street) from the harbour and would have this fantastic view of the theatre. 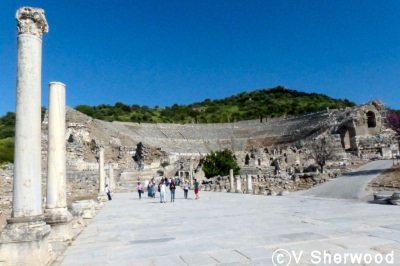 The theatre in Ephesus is the largest in Asia Minor, seating 25,000 people. The stage building (Skene) had 3 storeys and was 10 metres high. 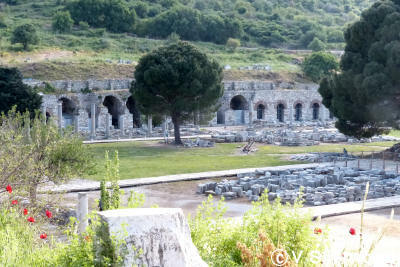 This is the lower agora or political meeting place. It was 160 x 73 metres. The arcade in the photo was the 3-nave basilica which housed commercial businesses. It is located across the street from the theatre. One of the highlights of Ephesus is the Celsus Library which is located on the opposite side of the agora from the theatre. It was built in 135 AD in honour of Julius Celsus Polemaeanus, Governor General of the Roman province of Asia, by his son. The 4 statues on the front of the facade represent Sophia (wisdom), Ennoia (intelligence), Episteme (knowledge), and Arete (virtue), characteristics which the son attributed to his father. It was one of the largest libraries in the ancient world and had over 12,000 scrolls. On the right is the arched south gate into the agora. Across the street from the library was the brothel. 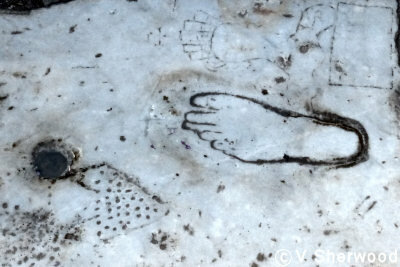 This footprint carved in the marble street points the way.. Built into the hillside across the street from Hadrian's Temple are terraced houses which belonged to weathy and influential people. The main floor along the street housed shops. 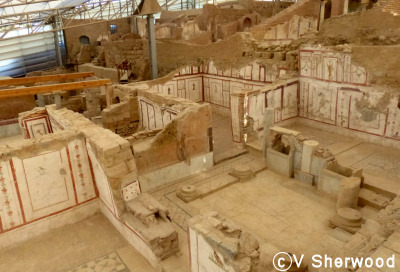 The roofs of the lower level were the terraces of the storey above Open attria allowed light to enter the rooms which had fine mosaic floors and walls and ceilings decorated with frescos. In some rooms there were tables covered with pieces of frescos, waiting to be fitted together - a dream job for a jigsaw puzzle enthusiast. 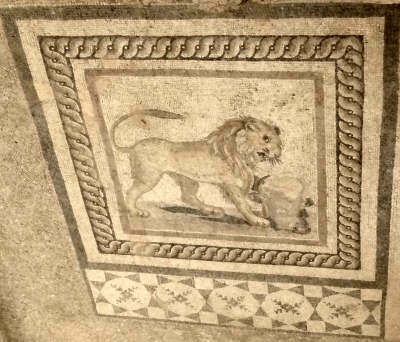 A mosaic floor in one of the terraced houses. The houses had underfloor heating and pipes for running water. 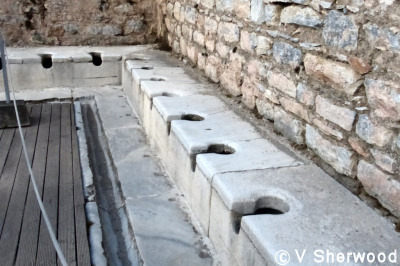 The public latrine in Ephesus was part of the Scolastica baths, beside the Temple of Hadrian on Curetes Street. There was running water in the trough in front of the seats and below them to flush out the waste. At each place there was a sponge on a stick, ancient toilet paper. Only men could use the latrine and had to pay for the privilege. The Temple of Hadrian was built at the beginning of the second century AD. Farther up Curetes Street is the Pollis fountain on the left and the Temple of Domitian on the right. The odeon was a small covered theatre for concerts, political meetings and social events.